Home > Ask Our Experts > Do I Have a Say in the Surname My Child is Given? My girlfriend and I have recently split up. It was a mutual decision on both are halves as we thought it the best thing to do. She's currently 6 months pregnant. I've paid for her to move into a new house and given her financial support well beyond what is required. I'm so looking forward to being a father, but she has just told me that I will have no say in the name and our daughter will have her surname. Can you tell me where I stand legally? Unmarried fathers can be in for a shock when it comes to their lack of parental rights. An unmarried father does not have any right to insist on the surname of their child, no matter how much financial support he provides. If the mother does agree then the child can have the father’s surname but only if she gives consent to this and the couple register the birth together. However, this does not mean that unmarried fathers cannot gain a say in the child’s upbringing or having their name on the birth certificate. Applying for parental responsibility (PR) will give unmarried fathers a number of parental rights recognised by the law. By obtaining parental responsibility the unmarried father has an equal say in the child’s upbringing in much the same way as a married couple share responsibility. This means that there is a legal duty for both parents to consult each other when it comes to major decisions on the child’s upbringing. These major decisions include change of surname, changing schools, major operations, and removing the child from a country for more than one month. If an unmarried father is not named on the birth certificate then he can apply to have birth re-registered to include his name on the birth certificate. The father can only do this if he has parental responsibility. If the father does have parental responsibility then re-registering can be undertaken even without the mother’s consent. This service is free of charge but there will be a fee for obtaining copies of the birth certificate. There are a number of ways for unmarried fathers to obtain parental responsibility. 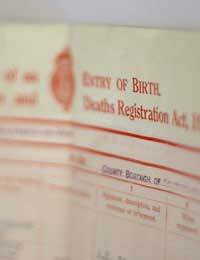 These can include registering the birth with the mother for births after 2003; this will give automatic parental responsibility. Another route is to obtain parental responsibility with the mother’s agreement and have it witnessed in court. If the mother refuses to make an agreement and will not add the father’s name to the birth certificate then the father can apply to the court for a PR order. There are differences in applying for parental responsibility in England and Scotland. More information on parental responsibility orders can be found at Her Majesty’s Court Services website.